10am – 5pm this coming Saturday and Sunday. Admission is free. The rain and thunder held off and we had another cracking Hill Race in Abernethy. 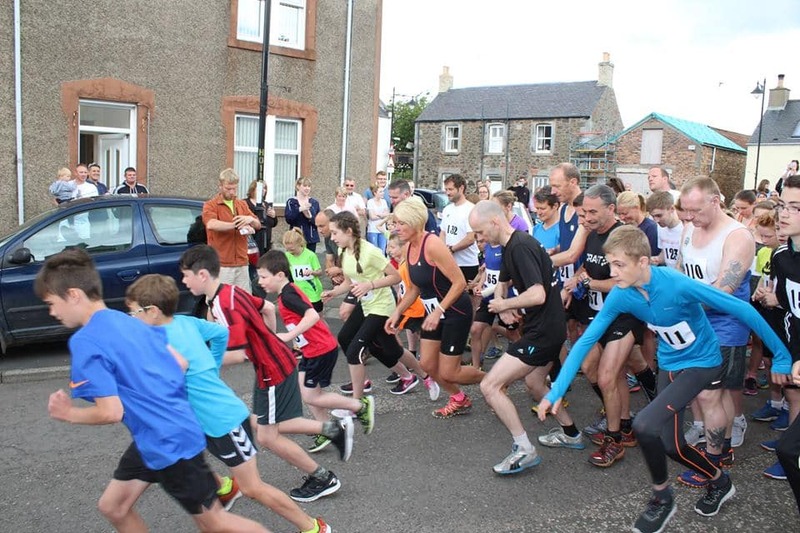 75 of you ran up and down Castlelaw in less than 45 minutes, more than half of you were children! This year saw the retirement of Colin Morrison as race organiser extraordinaire, although he couldn’t stay away altogether and was busy marshalling instead. Colin has spent many years (10?) organising the hill race and ensuring it’s success and deserves big thanks for his hard work and dedication. Keir Allen took on the mantle this year and did a grand job of sorting, organising, strimming, checking, shouting, awarding and all the other bits that go into running a successfull hill race. Looks like it is in very good hands for the future. 3rd Caitlin Fyffe. 29m 45s. 3rd Dougal Baird. 22m 33s. 2nd Amelia Cunningham. 32m 10s. 3rd Caitlin Devaney. 32m 11s. Thanks too to Jill Donnachie and Hannah Smith for acting as event photographers – you can see all the pictures of the day by clicking here. You can find the best ever times here including a number of new entries from this year. 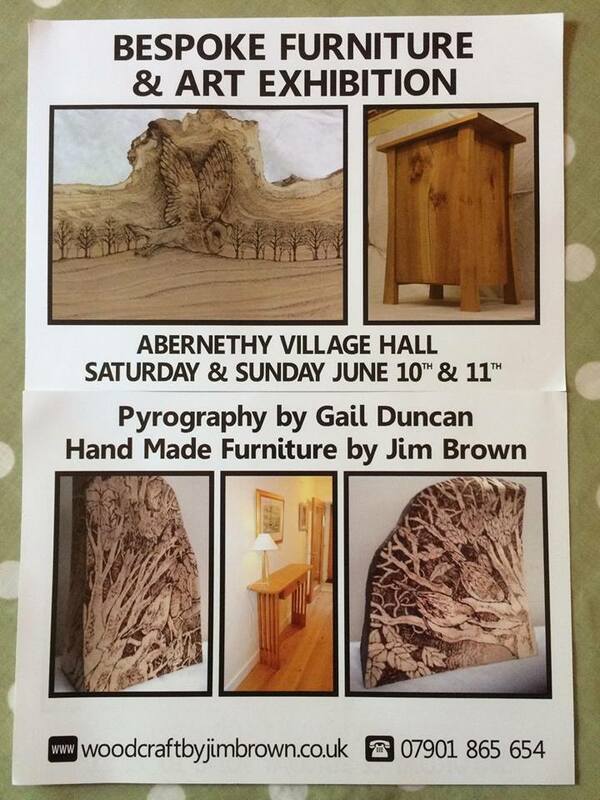 A huge big thank you to the community of Abernethy for today! Just finished counting up and the fete raised over £1700 plus the £200 we made at the kid’s disco last night. That’s a fantastic total and will really help towards the running costs and further improvements for the hall. So many of you came along and gave your time to help with gazebos (up and down! ), stalls, face painting, teas & kitchen and then the clearing up again afterwards. Others of you dressed up (well done Team Rainbows and Team Blues Family!) donated prizes, cakes, books and / or came along to spend and hopefully enjoy the day. We had some lovely stalls and it’s great to think they are all local businesses and people. We really are very grateful for all of it. There are a few key people without whom the day wouldn’t have happened. Chris Meek, Karen Jerrard, Ally Mallinson, Keir Allen and Jill Young have all given a big amount of their time to help plan & organise the day and decorate the hall and deserve big thanks. There are also probably people and things I’ve forgotten so thanks to you too! Fete Weekend is this Weekend! Hope you are all looking forward to a great community weekend? 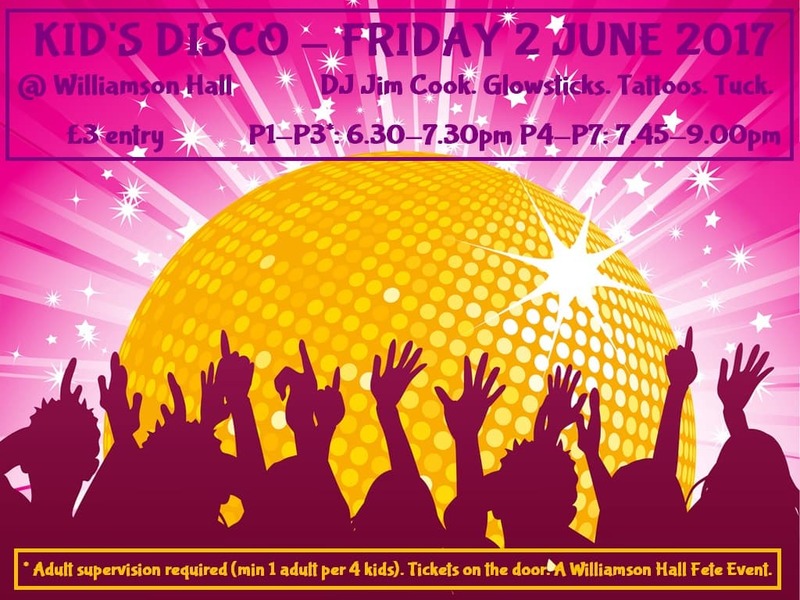 Things kick off Fri night with the kid’s disco up at the hall – an evening of tunes, glow sticks and sugar rushes with renowned village DJ Jim Cook. P1-P3 @ 6.30pm (adult supervision required) P4-P7 @ 7.45pm, see flier for full details. Then on Saturday it’s the fete itself at the hall from 1-4pm. We’ve got some lovely stalls coming along – Going A Bit Potty, Sweet, Allan’s Chilli Products, Aromie Design, Charlene’s Bespoke Bows and Cakes, Michelle Morton Designs (who will hopefully also have some of her new venture Cordon Farm Flowers along), Minerva Blue Sewing, Three Saints Way, The Wee Travel Company, Enjo, Partylite, Usborne Books, Forever Living and much more along with our usual second hand books, cakes, bottles, face painting, hair braiding and a cracking raffle stall. We’ve teas & homebaking, a bouncy castle, an ice cream van and community stalls such as Abernethy Scouting, Abernethy Baby & Toddler Group, a #supportourLily stall and a Community Council initiative. The hotly contested kid’s fancy dress competition will be judged at 1.30pm – group and individual prizes. It promises to be a great afternoon out! 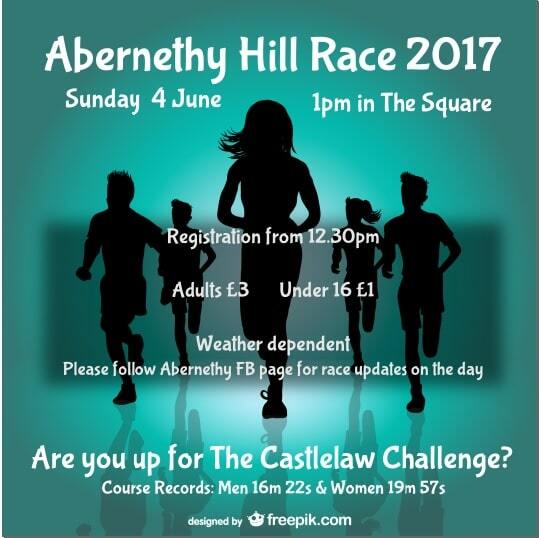 Sunday at 1pm is the annual Abernethy Hill Race – The Castlelaw Challenge! Best time is just over 16 mins from the square up to the top and back down again. Don’t worry if you can’t quite manage that time, as more sedate paces are equally welcome. Registration from 12.30pm in the square. Weather dependant. Bumper Raffle at the Fete! Still just over a week to go and we’ve already had some fantastic raffle prizes donated for our upcoming fete. The lovely folks at Muckmedden have given us a phenomenal two sets of family passes for their Eliminator Mountain Biking Festival Weekend, the new Bruadar distillery at Aberargie have donated a bottle of their liquer (as well as a generous financial donation), the soon to be finished Lindores Abbey Distillery have donated a voucher for a Champagne or Whisky Cream Tea, Senses Health & Beauty Ltd at Aberargie have given a Back, Neck & Shoulder massage and we’ve also family day passes to the The Scottish Deer Centre and Active Kids Adventure Park. The lovely Jamesfield Garden Centre have donated giftware and Mark Macneill / Na Mara Slate has given us one of his stylish hand made slate clocks. As ever the closer we get to fete the more prizes will be added so come along on the day to see what more we have! On top of that we’ve also been given generous financial donations from Branston Ltd, Let’s Cook Scotland and ASAP Contracts. The support of local businesses and the community makes a huge difference to the hall and what we can achieve so a big big thank you to all those who have donated towards our main fundraiser. Hope to see you all along on the 3rd June to have a chance at winning one of our fab prizes! Less than 4 weeks to go until it’s our annual fete weekend! 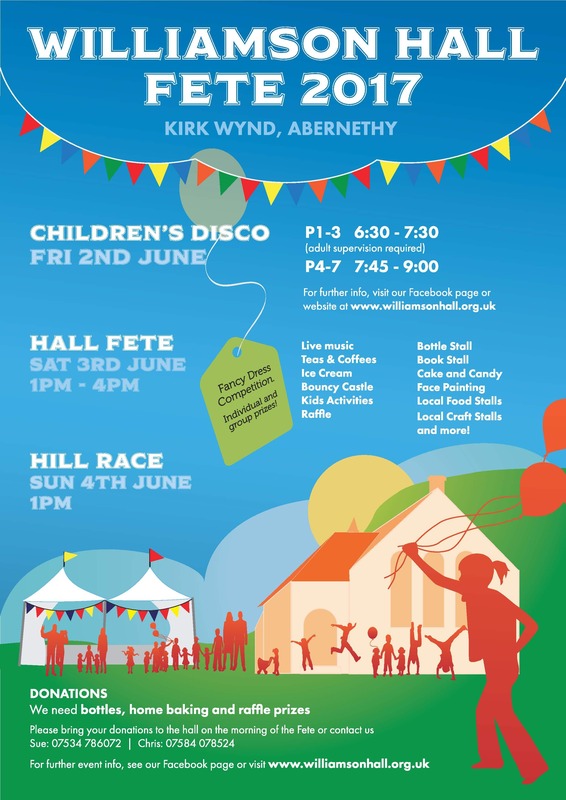 Things kick off in style with the kid’s fete disco on Friday 2 June, the Fete itself is on Saturday 3 June from1-4pm and the traditional village hill race will be on Sunday 4th. These are great community events and also the chance to raise some money for a good cause – all profits go towards maintaining and improving Williamson Hall. Hope to see you along! 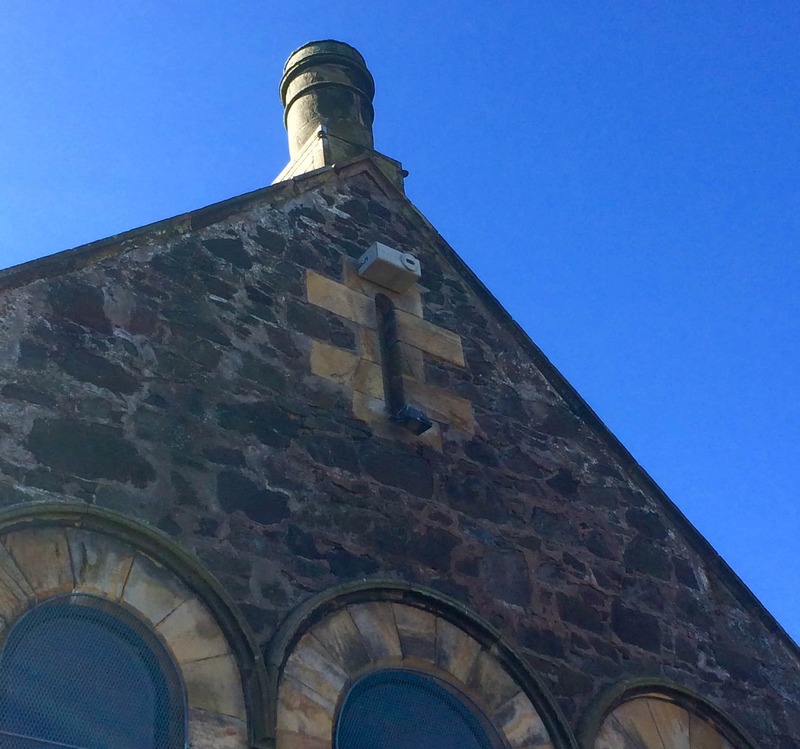 Next time you are up at the hall, take a look upwards and see if you can spot our new swift nestbox! Swift numbers are declining dramatically in Scotland, so we are hopeful that our box (installed by Tay Landscape Partnership’s Buildings for Biodiversity scheme) will soon attract a nesting pair. The Kirk is holding a church sale at the hall this Saturday from 2-4pm, in aid of church funds. There will be Refreshments, Accessories/Craft stall, Cake/candy/produce stall, Plants, Games, Raffle, Face painting and crafts for children. Entry; £3 adult, £1 child (includes activities). 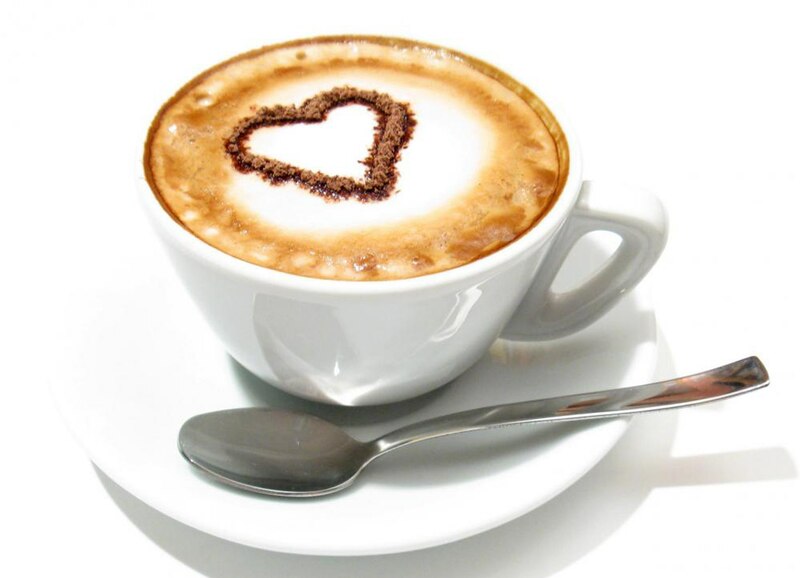 Everyone welcome for a lovely afternoon. 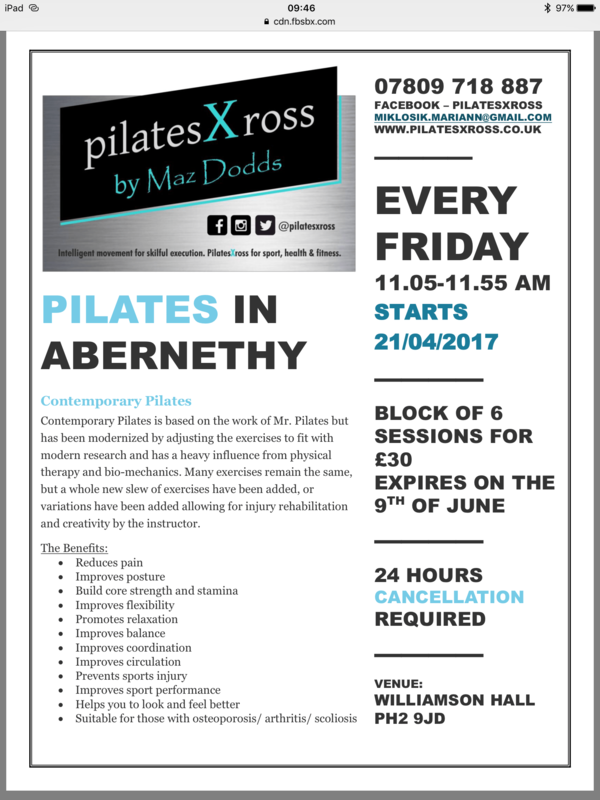 New Pilates class at the hall starts Fri 21 April. Got plans for Saturday? 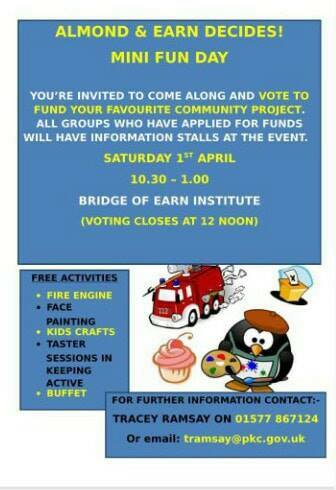 Fancy a family fun day with face painting, fire engine and an added dollop of community participation? One of our user groups (Baby & Toddler Group) have applied for funding via the Almond & Earn Action Partnership scheme and decision / voting day is this Saturday. Everyone attending gets a token that they can use to vote for the cause they think is most deserving, so it literally is a case of needing to turn out the numbers to be successful. They would very much appreciate your support and votes.